Get balanced protection for your combination to oily skin with the La Roche-Posay Anthelios XL Anti-Shine Dry Touch Gel-Cream SPF50+, a high protection formula for the face. The sensorial gel-cream texture has a dry touch finish, which absorbs quickly into the skin leaving no shine and no white marks. Suitable for use on even sensitive and sun-intolerant skin, the very high UVA-UVB protection ensures that the skin is shielded from the sun’s rays. Added La Roche-Posay Thermal Spring Water soothes and calms the skin. Apply liberally before sun exposure to both the face and the body, and reapply after swimming or towelling in order to maintain protection. Hypoallergenic, non-perfumed, non-comedegenic, paraben-free, water resistant. 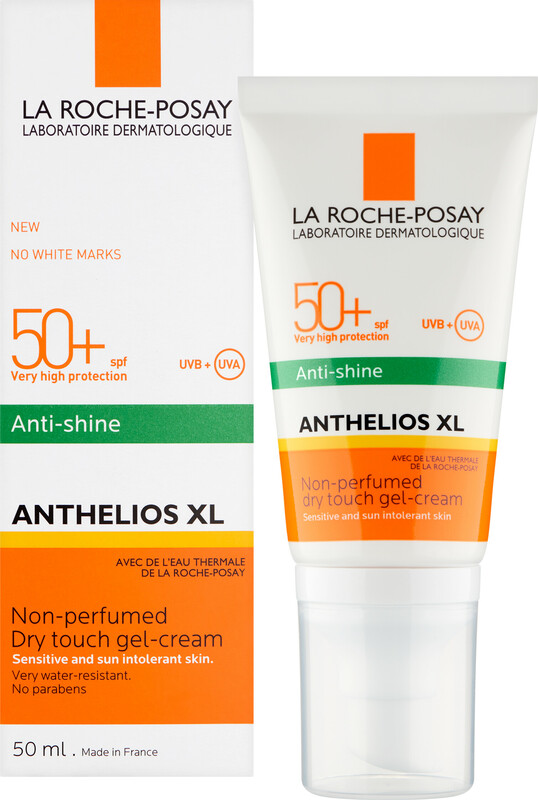 La Roche-Posay Anthelios XL Anti-Shine Dry Touch Gel-Cream SPF50+ 50ml is rated 4.3 out of 5 by 28. Rated 5 out of 5 by Wasa from Perfect everyday sunscreen I am very pale with dry skin and I've recently started to use retinol but was frustrated by how greasy my face was becoming having to wear high spf sunscreen every day until this was recommended to me. I bought two of these in the sale as well as the spray- which I haven't yet tried. This sunscreen is really great for protection as well as providing a really good base for makeup, I think my ultra wear looks better on top of this than it does on top of my usual primer. I do get a bit shiny around the t-zone by the afternoon, but no more than I normally would without spf, and definitely much less oily than with any other spf I have tried. It's also non-comedegenic, so I'm not getting any breakouts that I usually get around my hairline and jaw when wearing sunscreen a lot on my face. I have been recommending this to friends and I'm completely converted to using this all year round. Rated 5 out of 5 by ay4eto from Lovely product This sun protection cream has been recommended by my beauty specialist and it is perfect! Rated 5 out of 5 by Ciri from Great for combination skin all year round Helped my rosacea prone skin to get better thanks to calming Dimethicone ingredient. It is great for combination skin - dries matte and does not leave any feeling of being on. I have been using it all year round as good UVB/A cream and it protects from getting tanned very well. Rated 1 out of 5 by Hannahy from Personal opinion: avoid! I bought this all-in-one base product, thought it’d be perfect for a light trip in sunny days for my combo-oily skin. The actual shade is quite neutral, pale-medium. In my case, the product simply won’t blend, unlike other mousse foundations that I’ve tried, so I had to mix it with my moisturiser and I’d recommend using either dampened sponge or brush for application(not fingers). The coverage is sheer yet it clogged my pores like crazy. It doesn’t have much fragrance and has a hight level of sunscreen, that seem to be the only things I like about it. I really like the skincare products from LRP but this one is just not for me. I just find my own experience very contrasting from the other reviews thus feel the need to leave one of my own.